Blackburn СА.15 был одним из немногих самолетов в серии проектов СА (Commercial Aeroplane - коммерческих аэропланов) фирмы, воплощенных в металле. Первый проект СА.15А 1929 года предусматривал постройку моноплана с тремя моторами воздушного охлаждения Armstrong ДальшеMore>>> Siddeley Lynx IV мощностью по 240 л. с. (179 кВт), рассчитанного на перевозку 11 пассажиров. Но в проекте рассматривалась и возможность использовать схему биплана, а также колесное или поплавковое шасси. Дальнейшие проработки привели к появлению меньшего по размерам СА.15В. На этом этапе к работе подключилось Министерство авиации, желавшее выяснить достоинства и недостатки бипланной и монопланной схемы. Компанию "Blackburn" попросили разработать пару транспортных самолетов, рассчитанных на перевозку 10 пассажиров, отличавшихся только схемой крыла. Окончательный проект, СА.15С, создавался под руководством Б. А. Дункана, и поэтому самолеты получили прозвище "The Duncan Sisters" ("Сестрички Дункан"). Самолеты имели металлическую конструкцию. Обшивка фюзеляжей была выполнена из легких сплавов, а несущие поверхности были обшиты полотном. Биплан был двухстоечным, а моноплан имел крыло увеличенной площади. СА.15С Biplane и СА.15С Monoplane совершили первые полеты 10 июня и 4 октября 1932 года соответственно. С лета 1933 года машины проходили интенсивные испытания в НИЦ в Мартлешем-Хит. Тесты показали, что при одинаковой максимальной взлетной массе Biplane был медленнее, a Monoplane нес меньшую полезную нагрузку из-за большей массы конструкции планера. Предполагалось, что обе машины будут использоваться авиакомпанией "Imperial Airways" в Африке, но авиаперевозчик от них отказался. Biplane был пущен на слом в начале 1934 года, а вот Monoplane использовался для отработки автопилотов, радиостанций и других испытаний до начала 1938 года. EVER since the earliest days of flying, aircraft designers have been divided on the question: monoplane or biplane? The Wright Brothers were "biplanists," but, on the other hand, Langley's "aerodrome" was a tandem monoplane. In France the Voisin and Farman Brothers favoured the biplane, but the monoplane soon made headway, and of French designers Bleriot was, perhaps, the first to make the monoplane a real success. In Great Britain early flying history was made chiefly by the biplane, and for a period at any rate the monoplane was under official ban, as a result of certain wing breakages. Yet it should not be forgotten that Robert Blackburn, one of the earliest of independent British designers, devoted his earliest energies to the development of the monoplane, and for several years it was this type which was associated with his name. The question has remained unsettled until the present day, and not until quite recently has an effort been made to solve it by having two machines built, as similar as possible in everything but wing arrangement, so that one may be "flown against" the other. The order for these two machines was placed with the Blackburn company at Brough by the Air Ministry, and the two machines have now been finished and are doing constructor's trials preparatory to being sent to Martlesham for official tests. In the design of the two machines, it was decided to incorporate as many common features and units as possible in order that the comparison of the two types might be based upon identical specifications. Thus the two types are designed to carry ten passengers in identical cabins, to have the same cruising range with the same engines, to have the same pay load (2,000 lb. ), and to have as nearly as possible the same landing speed. The units common to both types include fuselage, engines, undercarriage, and tail. 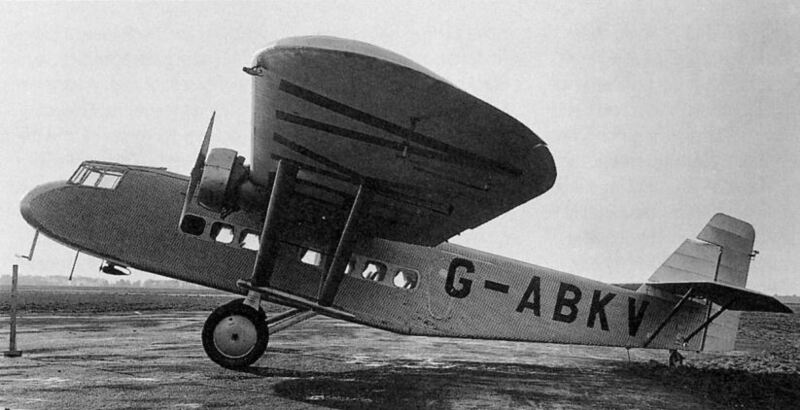 This has, perhaps, meant compromise in a few instances, such as in the arrangement of the undercarriage of the monoplane, but was considered worth while, not only because of the strict comparison which it made possible, but also because in that way certain economies in manufacture could be obtained. The two Blackburn civil types are of all-metal construction, with the exception of wing and control surface covering, which is doped fabric, it being held by the designers that this is preferable as it is cheap, light, and readily renewable, and gives a maximum of inspection facility. The fuselage is of a form of construction not hitherto tried in this country. A corrugated skin of "Alclad" is riveted to closely spaced internal formers, and reinforced by a certain number of longitudinal stringers, although the corrugations of the skin stiffen it considerably and make it the better able to support compression loads without buckling. The skin is applied in fairly large panels, and as the fuselage has rounded corners, the skin corrugations over the rear portion (where the taper occurs) sweep inwards around the corners, finally to meet on the bottom centre line where the joint is well out of sight. Not that the joint is at all unsightly as a joint. In fact, Blackburns have made a very neat job of joining adjacent sheets, by using a standard "three-wave” form of flattening. The wings of both monoplane and biplane have metal spars and ribs, a type of construction also used in the tail organs. The biplane is a normal two-bay type, with the engines carried on special gap struts approximately midway between top and bottom wings. The monoplane wing is strut braced, and the bracing is so arranged that the points of attachment to the fuselage are the same as on the biplane, so that placing of bulkheads, wing fittings, strut fittings, etc., is unaltered. The wings are not designed to fold on either machine. Bristol-Frise type ailerons are used on both types. The undercarriage of both machines is of the "split" type, with oleo-pneumatic compression struts and Dunlop wheels fitted with Bendix brakes. A castoring tail wheel is fitted, and permits the machines to be swung in very small circles by the independently-operated wheel brakes. On the biplane the shock-absorbing leg is attached to the lower wing. On the monoplane a somewhat elaborate structure has been used, so as to enable the same points of attachment to be used by the common undercarriage unit. The power plant of both machines is the Armstrong-Siddeley "Jaguar" IV C, of 400 h.p. In the monoplane the engines are carried in streamline nacelles, placed in accordance with latest practice slightly ahead of the leading edge, and on a level with it. This placing has been found to give the least interference drag, and to give the best all-round results. The petrol tanks, of a total capacity of 170 galls. (773 litres), giving a cruising range of 356 miles (572 km. ), are placed inside the wing of the monoplane, and in the top plane of the biplane. The cockpit has accommodation for two pilots side by side, and is exceptionally roomy, as well as affording an excellent view in all important directions. A door in the back wall leads to the luggage compartment and thence to the cabin. A partition with a door opening in it divides the cabin into two compartments, of which that in front has four seats and the aft compartment six seats. The seats are by no means crowded together and are very comfortable, having good upholstery and adjustable backs. The lower half of the cabin is lined with leather, and the upper with cloth to match the leather, the whole giving a very "cozy" appearance. The space between the cabin lining and the metal wall is filled with Kapok, which assists materially in reducing engine noise. Ventilation has been well attended to, and by each seat there is a spherical louvre, universally mounted, so that the passenger can direct the air as he wishes. Warm air is conveyed from heater muffs on the exhaust pipes. The capacity of the cabin is 540 cu. ft. (15,3 m.3). 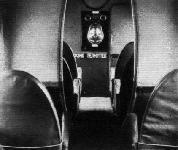 The luggage compartment between cockpit and cabin is of 127 cu. ft. (3.5 m.s) capacity, while the smaller luggage and mail compartments aft of the cabin has a capacity of 100 cu. ft. (2,8 m.s). The main dimensions of the machines are :- Biplane: Length o.a., 54 ft. 8 in. (16,7 m.); wing span, 64 ft. (19,5 m.); height, 15 ft. 7 in. (4,8 m.); wing area, 1,037 sq. ft. (96,4 m.2). The monoplane has the same overall length as the biplane, but the height is 14 ft. (4,3 m.), the wing span 86 ft. (26,2 m.), and the wing area 1,068 sq. ft. (99,1 m.2). To obtain a clear indication of what these comparative figures mean it is necessary to examine some of the weight items in slightly more detail. As would be expected, the monoplane wing has come out a good deal heavier than the biplane wings. Incidentally, in both cases the figure includes weight of engine mountings and nacelles. As the monoplane wing area is greater, the specific wing weight is not as greatly different as the figures indicate, being 2.45 lb./sq. ft. for the monoplane wing and 2.08 lb./sq. ft. for the biplane wings. The fact that the fuel weight of the monoplane is smaller than that of the biplane is due to a slightly smaller quantity being carried. There is a slight increase in the petrol system weight of the monoplane, due presumably to the fact that in the biplane the engines are almost directly under the tanks, and the whole system thereby simplified. As the two machines have not yet been through their tests at Martlesham, actual performance figures are not available, but the estimated performance figures are of interest in showing that from a performance point of view the two machines are very nearly identical. For example, the estimated top speed of the biplane at sea level is 123 m.p.h. (198 km./h. ), and that of the monoplane 124 m.p.h. (199 km./h.). The estimated landing speed of the biplane is 60 m.p.h. (96.5 km./h. ); that of the monoplane 57 m.p.h. (92 km./h.). The biplane has an estimated service ceiling of 11,000 ft. (3,360 m.), while that of the monoplane is 14,600 ft. (4,460 m.). The initial rate of climb of the biplane is 630 ft./min. (3,2 m./sec), and of the monoplane 730 ft./min. (3,7 m./sec). Both machines have been designed for a cruising range of about 350 miles (563 km. ), and both have a pay load of 2,000 lb. (907 kg.) for that range. The Blackburn Aeroplane & Motor Co., Ltd.
MR. ROBERT BLACKBURN, the Managing Director of the firm which bears his name, is one of the pioneers of British aviation. He designed his first machines in 1909-10, and formed his own company in 1914. Ever since those early days the name Blackburn has been closely associated with British military aeronautics. It is particularly to the naval side that the Blackburn firm has devoted its energies, and such aircraft as the "Dart," "Beagle," "Nautilus" and "Ripon" have been familiar Fleet Air Arm types for a number of years. Several years ago the Blackburn firm turned its attention to the design and construction of flying boats, and of these a whole "family" were produced, beginning with the "Iris I" and for the present ending with the “Iris V." A monoplane type, the "Sydney," was produced some years ago. 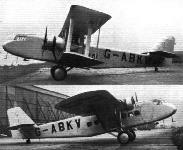 Smaller aircraft bearing the Blackburn name have also made their appearance, among them being the "Bluebird" light plane side-by-side two-seater and its modern version the B.2 Trainer. The Blackburn "Lincock" is a low-powered single-seater light fighter with high performance and extraordinary manoeuvrability, but economical to operate. The latest aircraft to be produced by the Blackburn firm are two civil types, designed to the order of the British Air Ministry for the purpose of testing out the relative advantages of the biplane and monoplane. These two machines, which are at the present time at the Martlesham Experimental Establishment for thorough performance tests, were designed to have the same range, pay load, power plant and passenger accommodation. 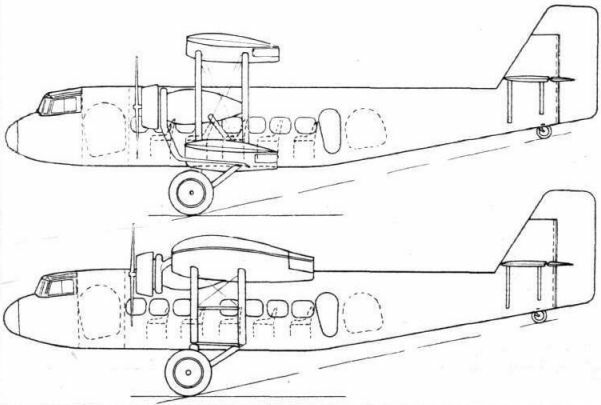 The fuselages of the two types are identical, as are also the two undercarriages, and the only differences are to be found in the arrangement of the wings and engines. Both are twin-engined machines, and both were designed to operate from aerodromes situated at considerable altitudes, such as are to be found on sections of the Cairo-Capetown air route. In general structural principles used, the two Blackburn civil machines are also similar, i.e., the fuselage is a semi-monocoque metal structure, with "Alclad" corrugated sheet covering, and the wings have metal spars and ribs, but fabric covering. The engines in both types are Armstrong-Siddeley Jaguar IV C. In the biplane they are mounted outboard on special gap struts, and in the monoplane they are carried ahead of the leading edge of the wing, with fairings merging the lines into the wing surfaces. The petrol tanks, with a capacity of 170 gall. (773 litres) are housed inside the wing of the monoplane and in the top centre section of the biplane. The cabins of both machines have seating accommodation for 10 passengers, seated in comfortable chairs along the sides of the cabin. Large windows give light and view, and the windows have been so arranged that in case of emergency they can be removed entirely, thus providing extra emergency exits for the passengers. 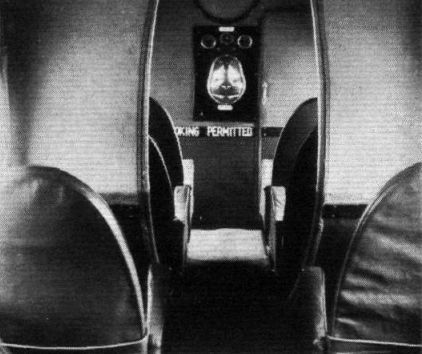 In the cockpit in the nose of the fuselage are two seats side by side, the intention being that a crew of three should be carried: chief pilot, assistant pilot, and wireless operator. As there is no engine in the nose of the fuselage, and very large windows and windscreens are provided, the view obtained by the pilots is exceptionally good in all directions which matter. The biplane wing arrangement is the orthodox British one, with one pair of interplane struts on each side in addition to the gap struts which carry the engines. The monoplane has a semi-cantilever wing, the external bracing struts reaching out approximately halfway from the fuselage to the wing tips. Length, o.a. 54 ft. 8 in. (16,7 m.). Wing span 64 ft. (19,5 m.). Gross weight 12,145 lb. (5 518 kg.). Pay load 2,340 lb. (1 061 kg.). Fuel 1,392 lb. (632 kg.). Length o.a. 54 ft. 8 in. (16,7 m.). The cruising range of both machines is approximately 350 miles (563 km. ), and the estimated cruising speed is in the neighbourhood of 110 m.p.h. (177 km./h.). Крыло СА.15 Monoplane состояло из двух консолей, крепившихся к верхней части фюзеляжа. Моторы Jaguar были установлены в гондолах на передней кромке крыла. BIPLANE OR MONOPLANE? The two Blackburn machines built to settle this question. ON THE BANKS OF THE HUMBER: The two Blackburn civil machines from above. THREE-QUARTER REAR VIEWS: The two Blackburn machines at Brough, ready to go to Martlesham for test. THE BLACKBURN MACHINES: The unusual undercarriage of the monoplane is due to the use of the same points of attachment being used as on the biplane. THE TWO BLACKBURN CIVIL MACHINES: The fuselages, etc., are identical. The engines in both types are Jaguars. Крыло Biplane было неразъемным. Моторы Jaguar в гондолах были установлены на внутренних стойках бипланной коробки. 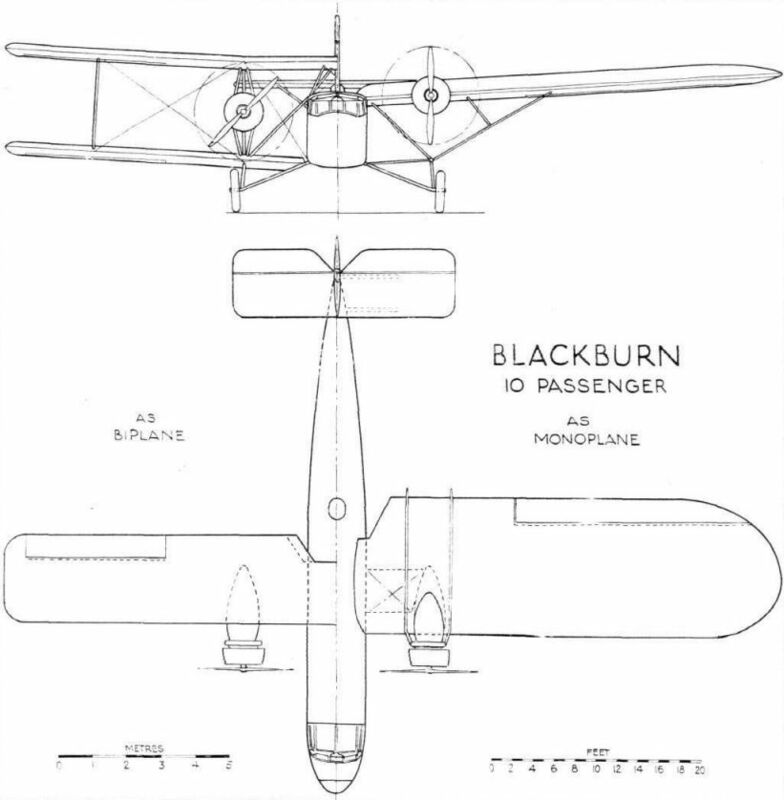 BLACKBURN 10-PASSENGER CIVIL BIPLANE: The two engines are "Jaguars." 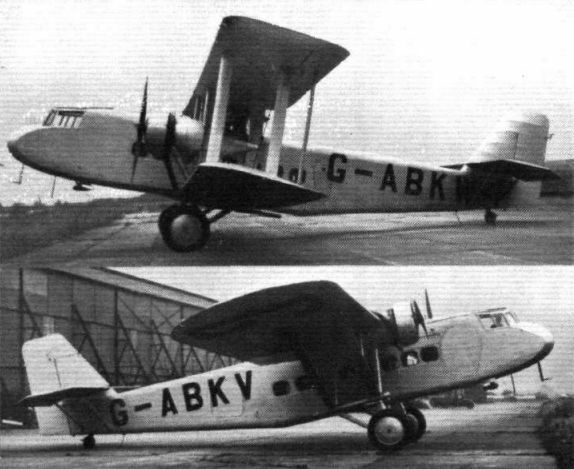 "NEW AND EXPERIMENTAL": In front the Fairey Night Bomber (two "Kestrel"), and behind it the new Blackburn ten-passenger machine (two "Jaguar"). THE CABIN: A partition divides it into two compartments. Note that smoking is permitted.